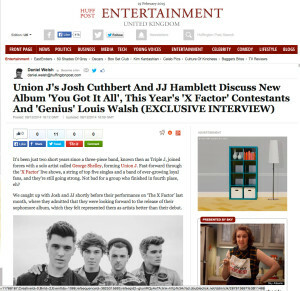 Union J returned in Spring of 2014 with a new label, album and attitude. The first single was an upbeat Summer hit and our brief was to create fun and creative promo opportunities to help reignite interest, engage, and build on, the band’s fanbase online. Further to this we were tasked with trying to reach a slightly older, less ‘tween’ demographic, who would appreciate the new direction of the music and that the band had ‘grown up’ since their XFactor days. And finally, to showcase the band’s voices in more ‘stripped back’ performance promo opportunities. In order to achieve showcasing the band’s more stripped back performances, very early on in the campaign, we organized a session with Blinkbox Music. We worked really closely with the Blinkbox team to find the right venue and we were keen to present the band in a more ‘stripped back’ visual way too. The results are two great sessions, showing the band in a very different light. 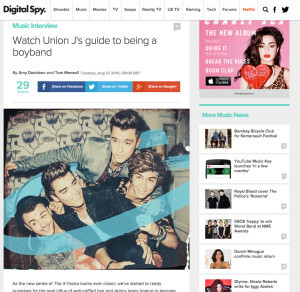 We worked closely with Buddybounce on a strategy for the Union J campaign to engage fans and encourage them to work together to promote ‘You Got It All’, the second single in the campaign. We set up a campaign where fans had to collectively reach a target number of clicks of a URL to the ‘You Got It All’ iTunes’ link (25,000 clicks). 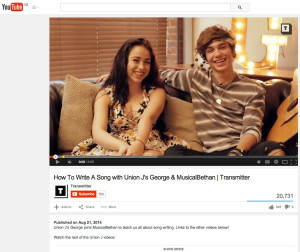 When fans reached the target, they unlocked the exclusive content – George’s solo cover of the new single. This campaign guaranteed referrals to the iTunes link (each click had to be a unique IP address) and encouraged fans to come together and work towards one goal. 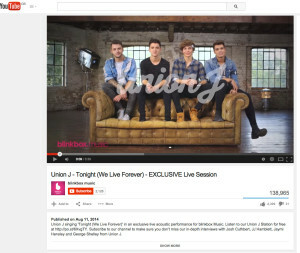 In addition to this, we set different goals to initially encourage the fanbase, 10,000 clicks unlocked a snippet of the track, 15,000 clicks unlocked a Union J follow spree on Twitter. 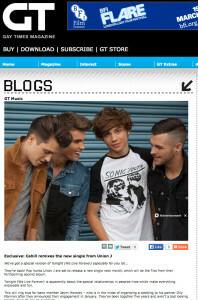 Charmfactory’s online PR campaign was part of the overall PR campaign which helped Union J achieve two top ten singles. Transmitter RAW – Thousands of fans watched the live show and VOD overnight, with floods of comments coming in across social networks – generating almost 10m impressions around the event hashtags in 24 hours. 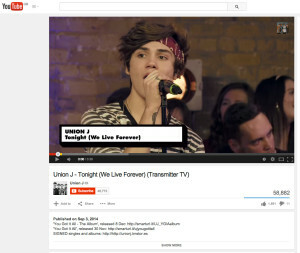 The subsequent roll-out of the ‘How To’ video on demand content across Transmitter, Union J and MusicalBethan’s channels with annotations linking between them creates audience reach for the boys in excess of 300,000 fans on YouTube alone. 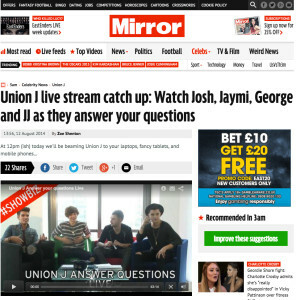 Mirror Live Stream Q+A – Over 5,000 people tuned in live and over 10,000 people watched back, post-stream. The Mirror were extremely happy – tweets about the live event were getting, on average, double the engagement of usual Mirror Celeb tweets and on the day their tweet reach was the highest it had been all month – almost by four times as much as on a normal day.